of the entity. The whole thing can move about in near frictionless condition. The small friction is attributed to the excited helium II atoms. Frictionless Flow - Helium II flows with practically no friction through small openings, closely-packed powders, and narrow capillaries, like water through a sieve. It is referred to as superleak by some scientists. Creeping Film - (a) A small vessel, originally empty, fills up when partially immersed in Helium II. (b) When the full vessel is lifted up, the helium II would empty itself by means of a film creeping along the walls of the vessel (see upper insert in Figure 13-05d2). (c) This 30 nm-thick helium II is called "Rollin Film" named after its discoverer. The effect is the result of the capillary forces (the combination of surface tension and adhesive forces between the liquid and container) dominating the gravity and viscous forces. 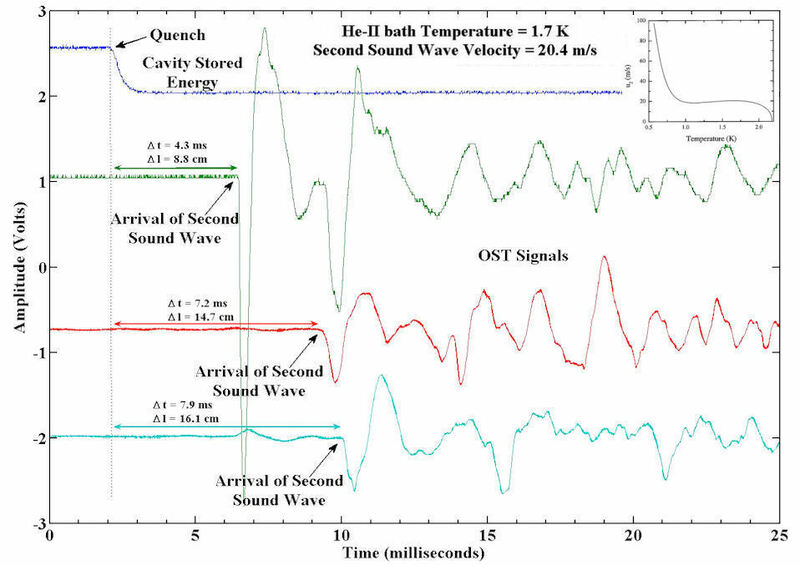 Second Sound - When rapid local variations in temperature take place in a small region of helium II, these variation are propagated as temperature wave (variation of temperature instead of variation of density in the normal sound wave). This is called second wave, which is responsible for the high thermal conductivity of helium II - several hundred times that of copper. Figure 13-05e shows the temperature wave reaching three different sensors. usage is on LHC, which uses pressurized helium II as coolant for the parts and saturated helium II as heat transport depositing the heat at the heat exchanger (Figure 13-05g). Pressurized helium II has the additional advantages of minimizing leak and electrical breakdown. Two BECs of approximately 2x106 sodium atoms each, and separated by about 160 m are created. A coupling laser beam (in the -z direction) excites the condensates from the |2> state to the |3> state. A probe laser pulse (in the +z direction) resonates with the 1st condensate to make the transition from the |1> state to the |3> state. The pulse is spatially compressed (by a factor of 5x107) to a length much shorter than the coherent extent of the condensate (see Figure 13-05h). 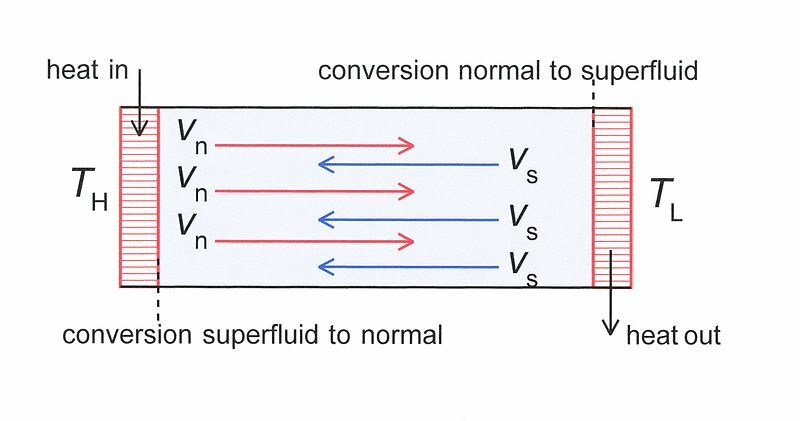 The coupling field is then turned off leaving the 1st condensate in a superposiition state with two components. The amplitude and phase of the pulse, i.e., the wave function 1, are imprinted to 2 within the superposition. In another word, 2 1. In order to conserve linear momentum, 2 recoils from the 1st condensate in the form of matter wave and moves in the +z direction to the 2nd condensate (see actual image at the top right of Figure 13-05h). The 2nd condensate absorbs the matter wave. The coupling beam is turned on again to drive the transition from the |2> state to the |3> state. The original pulse is recreated when the condensate returns from the |3> state to the |1> state. It is suggested that since noise is reduced in slow light, it would allow all types of information to be transmitted more efficiently, and it could someday be used in future computers that use light instead of electrons to carry and process information. Anyway, the new technology has a tremendous variety of applications un-imaginable for the research sceintists now. 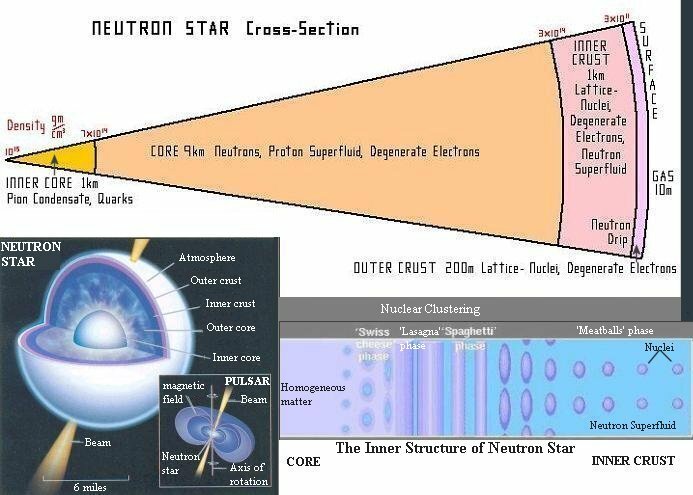 When the core of the star collapses to a density of about 1014 gm/cm3 (of the order of that in the nuclei) it causes the atomic electrons to combine with the nuclear protons in the electron capture reaction as shown in Figure 13-05i. This is the point where gravitational forces have won out over the pressure supplied by nuclear matter. Surface - There is an atmosphere of several centimeters thick. The ionized gas is highly compressed with a density gradually rising to 103 gm/cm3. 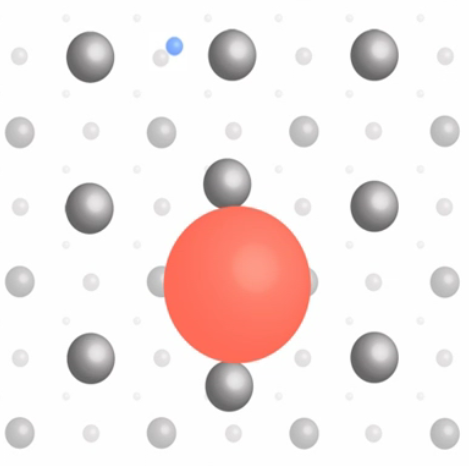 It may be in a condensed state (liquid or solid) in the presence of strong magnetic field (~ 1012 gauss), which strongly affects the structure of atoms. The temperature at the surface is about 107 oK. Outer Crust (Envelope) - At the top of the crust, the nuclei are mostly iron 56 and lighter elements in lattice (solid) form, but deeper down the pressure is high enough that the equilibrium atomic weights rise, elements with Z=40, A=120 will form eventually. At densities of 106 gm/cm3 the electrons become degenerate, meaning that electrical and thermal conductivities are huge because the electrons can travel great distances before interacting. Inner Crust and Outer Core - The "neutron drip" starts at a depth with a density around 4x1011 gm/cm3. At this point, it becomes energetically favorable for neutrons to float out of the nuclei and move freely around, so the neutrons "drip" out. They pair up to form bosons, which compose the neutron superfluid. Even further down, there are mainly free neutrons, with a 5%-10% sprinkling of protons and electrons. As the density increases, a sequence dubbed the "pasta-antipasta" is in place (see Figure 13-05j). At relatively low (about 1012 gm/cm3) densities, the nucleons are spread out like meatballs that are relatively far from each other. At higher densities, the nucleons merge to form spaghetti-like strands, and at even higher densities the nucleons look like sheets (such as lasagna). Increasing the density further brings a reversal of the above sequence, where the nucleons change to holes (anti-particles) forming (in order of increasing density) anti-lasagna, anti-spaghetti, and anti-meatballs (also called Swiss cheese). Meanwhile the protons and electrons respectively couple into Cooper pairs to form the superconductive material in the outer core. Inner Core - When the density exceeds the nuclear density 3x1014 gm/cm3 by a factor of 2 or 3, really exotic elementary particles might be able to form, like pion condensates, lambda hyperons, delta isobars, and quark-gluon plasmas etc. which carry away a lot of energy. The charged protons there also make the core superconducting. The onset of superfluidity in materials on Earth occurs at extremely low temperatures near absolute zero, while it happens in neutron star at temperature near a billion degrees. 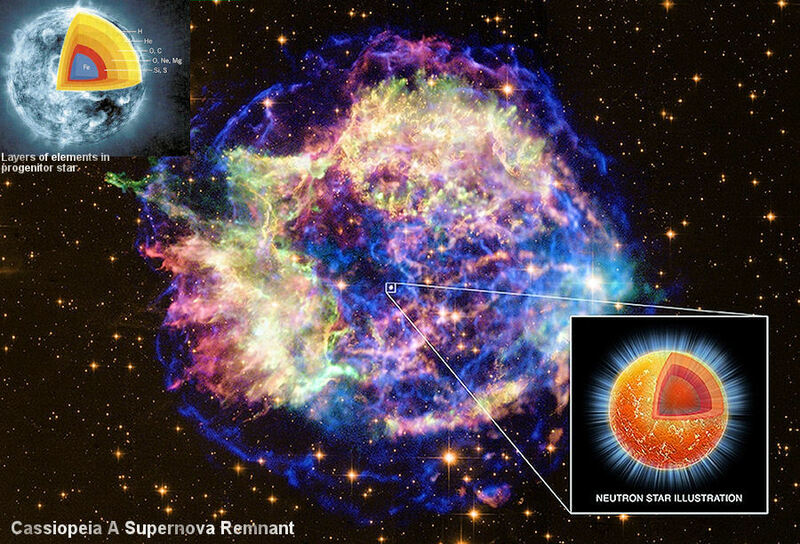 The difference can be explained by the fact that the low temperature variety involves the very weak force between Cooper pair, while the interaction is via the strong nuclear force between nucleons in neutron star. This information may show us how to achieve superfluidity and superconductor at room temperature on Earth. 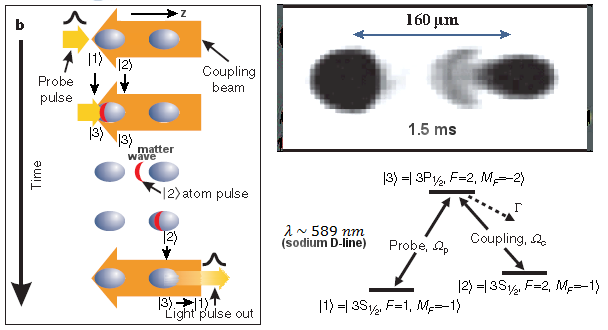 The X-ray image in Figure 13-05k is colored in red, green and blue, optical data is in gold color. Higgs Condensate - According to the Standard Model of the elementary particles, all the elementary particles are massless when they emerged from the moment of Big Bang. This is the symmetric phase for the Higgs fields at high temperature. About 10-10 sec after the Bang, the Higgs fields made a phase transition to the Higgs phase at low temperature (~ 100 Gev). bombarding the Higgs condensate with high energy protons, some of which excited the Higgs bosons to a detectable level for a fleeting moment. 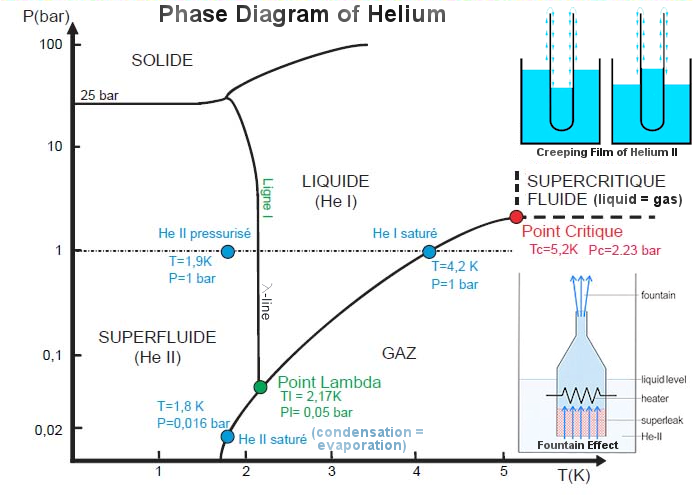 Useful technical applications of superfluidity in daily life is very limited as it is quite difficult - and therefore expensive - to reach the low temperatures necessary for helium to become superfluid. The two practical examples above are either very expensive or elaborated scientific projects. On the other hand, the two conjectures about natural phenomena seems to be a reasonable explanation, but also cost a lot of money to observe or prove. In short, superfluidity is not cheap to come by. cooling occurs only if the initial pressure and temperature lie inside a curve called the inversion curve (see upper left diagram in Figure 13-05m for hydrogen gas). Ordinary tap water is sufficient for nitrogen gas, but liquid nitrogen (< 70K) must be used to cool hydrogen gas, and liquid hydrogen (< 20K) to cool helium gas. 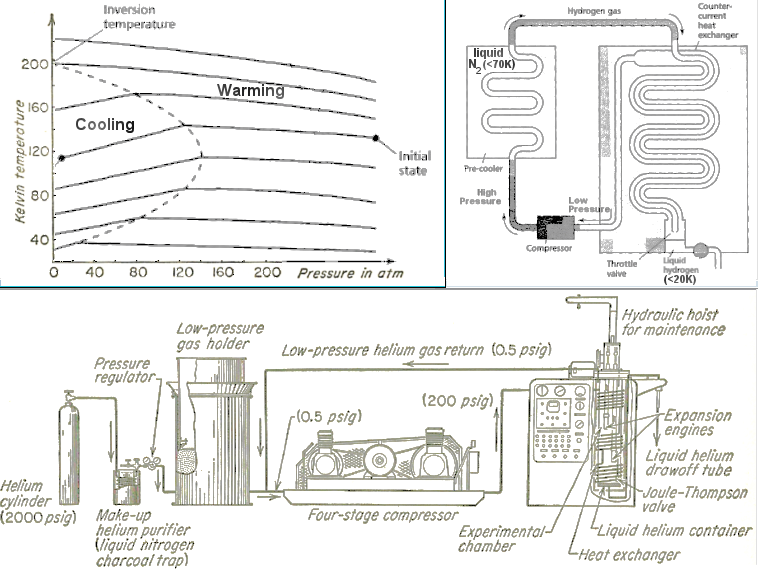 As shown in the upper right diagram of Figure 13-05m for a typical liquefying apparatus, the gas is pre-cooled to a temperature within the inversion curve, and run through the heat exchanger repeatedly until the gas is liquefied. The drawing in lower Figure 13-05m is the schematic diagram of a liquefying plant for mass-produce liquid helium. The incoming laser beam is tuned slightly below the resonance absorption of a stationary atom (or ion) so that only those moving toward the beam would absorb the photon. 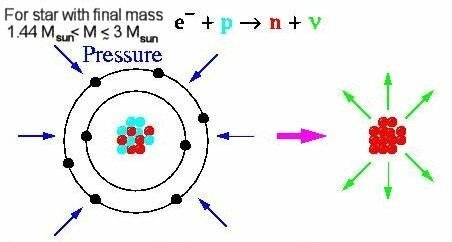 The velocity of the atom is reduced by an amount : v = p/m, where p = h/ is the momentum of the photon, and m the mass of the atom. For D-line laser beam and sodium atom ~ 589 nm, and m ~ 3.7x10-23gm, v ~ 3 cm/sec, which seems to be very little comparing to the average speed of the atoms about 6x104 cm/sec at room temperature. However, a laser can induce on the order of 107 absorptions/sec so that an atom could be stopped in a matter of 10-3 sec. The atoms re-emit the photon in random directions. 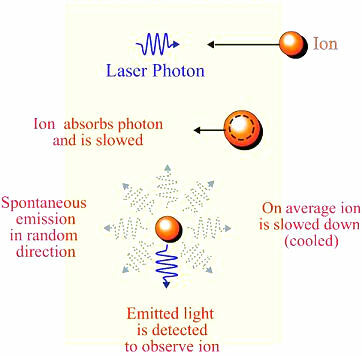 Since the initial momentum loss was opposite to the direction of motion, while the subsequent momentum gain was in a random direction, the overall result of the absorption and emission process is to reduce the speed of the atom (provided its initial speed was larger than the recoil speed from scattering a single photon, see Figure 13-05n). 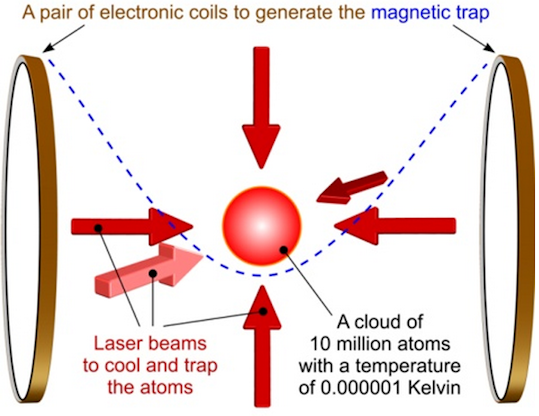 In practice, laser cooling involves millions of atoms, which are held together by magnetic field and bombarded by multiple laser beams to reduce the temperature to 10-6 K or even lower.